Together with its members and external safety related organizations, PLCopen defined safety related aspects within the IEC 61131-3 development environments. With this, the safety aspects can be supported by a dedicated software tool, which is integrated into the software development tools. As such it combines the logic and motion application development with the related safety aspects. This combination helps developers to integrate safety related functionality into their systems, even from the beginning of the development cycle. Also, it contributes to the understanding of safety aspects, as well as reducing the certification time and costs by relevant organizations. BGIA, the German certification institute for research and testing reviewed the PLCopen specification Part 1 and confirmed that it meets the relevant aspects of IEC 61508 and the related standards and can be used as a part of a specific safety requirement specification. 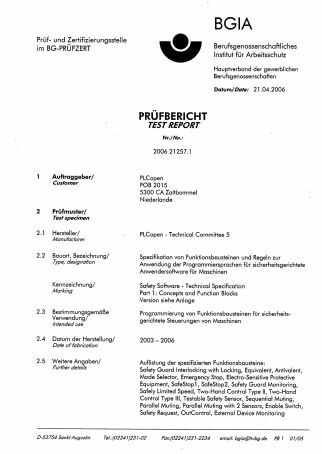 The German test & certification organization DGUV approved the PLCopen Specifications Part 3 and Part 4 as suitable basis to develop function blocks for safety applications for presses. 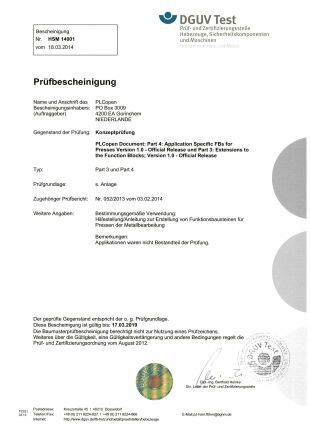 As such the DGUV recommends that for safety applications for presses the function blocks are developed according to the PLCopen document and that their functionality is tested on a press. The development environment, including the safety related function blocks, as well as the underlying hardware, have to be certified by the relevant safety related bodies. In order to be able to be certified, certain rules, like described in IEC 61508 and related standards like IEC 61511, are applicable. The PLCopen specification provides a framework for this; however the overall requirements are beyond the scope of PLCopen, and have to be dealt with by external dedicated organizations. 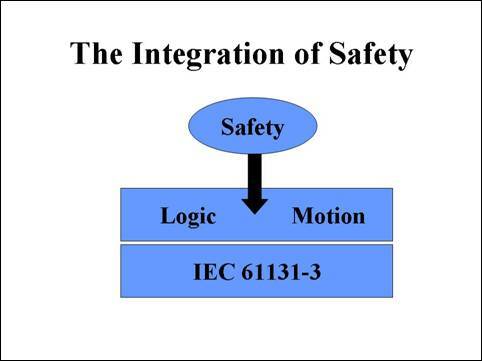 Within an application, a certification includes the safety related software combined with the infrastructure, like sensors, switches and actuators, connection schemes, etc, like described in standards like IEC 62061. Certification or approvals for the application software are made easier, however the full application have to be dealt with by external dedicated organizations. The use of the PLCopen logo does not give any guarantee about any compliance or fulfillment. The use of the logo just refers to the inclusion of the ideas and guidelines as described in the PLCopen specification, within the relevant software environment, and the availability of this information in more detail on the relevant section of PLCopen website. The introduction of safety approved networks makes the control of drives and motion more and more a software item: hard-wired systems are replaced by software commands over networked systems. This is also pushed by initiatives like Industry 4.0 to create more flexibility preferably at the same quality and price levels. However, the different networks come with different solutions, which create problems at the users especially in production environments with heterogeneous networks. To harmonize this, PLCopen started a working group on SafeMotion, which created a generic proposal to solve the motion control safety aspects over the different networks like ProfiSafe, Safety over Ethercat, CIP Safety over Sercos, OpenSafety, CC-Link IE and Mechatrolink, as well as user area’s as described in OMAC. Read more on PLCopen SafeMotion.